With the prospect of more oil being discovered in Africa - and riding on the thriving relationship between China and Africa - Chinese companies are looking to enhance their investment in the continent's oil and gas sector. Through the Belt and Road Initiative, China is encouraging enterprises to invest overseas, and Africa's potentially lucrative yet unexploited oil and gas sector offers an opportunity to do just that. Already, three major State-owned companies - China National Offshore Oil Co, an oil and gas producer; PetroChina, the largest oil and gas producer and distributor in China; and China Petrochemical Corp, known as Sinopec, which is primarily a refining company - are actively investing in Africa. These companies, which have concentrated their investments in West Africa, are currently spreading their wings to new frontiers. East Africa, which has so far not stood out on the global energy map, other than as a cash-strapped oil importer, is poised to become one of the world's most interesting oil and gas hot spots, according to a survey by Vision Gain, a United Kingdom-based business intelligence company. The report says Mozambique's and Tanzania's substantial offshore gas reserves, and their proximity to Asian demand centers, offer potential for liquefied natural gas exports by the end of the decade. Uganda and Kenya, on the other hand, present opportunities for commercial oil production. CNOOC already has a presence in Uganda, which claims East Africa's largest reserves. The company has been licensed to extract oil from the Kingfisher oil field in Uganda's Albert Basin, as well as to undertake pre-development activities. CNOOC was the recipient of Uganda's first-ever oil production license in 2013. The Lake Albert Basin, which is the most promising area for petroleum production in Uganda, has 20 fields. As well as CNOOC, two other companies have been given production licenses for the basin - Tullow Uganda Operations (three fields) and Total E&P Uganda (five fields). In 2016, the route plan for an oil pipeline in Uganda was confirmed, laying the foundation for accelerated development of the oil fields. Xiao Zongwei, president of CNOOC Uganda, says East Africa presents many opportunities as a new frontier that Chinese companies should take advantage of. "The relationship between Africa and China has been good for decades; hence, Chinese companies have a good opportunity to help the continent exploit its energy resources," he says. CNOOC also has assets in Nigeria. At the end of 2016, CNOOC's reserves derived from Africa reached 138 million barrels and production reached 80,297 barrels per day. This represented about 3.6 percent of the company's total reserves and 6.2 percent of its daily production. Apart from Nigeria and Uganda, CNOOC also owns interests in the Democratic Republic of Congo, Algeria and Gabon. In Nigeria, CNOOC owns a 45 percent interest in the OML 130 block, a deepwater project comprising four oil fields. With a maximum crude oil production capacity of 2.5 million barrels per day, Nigeria ranks as Africa's biggest producer of oil and the world's sixth-largest oil producing country. Many other Chinese companies are also involved in Nigeria's oil sector investment. Africa was the scene of Sinopec's first step toward internationalization in the 1990s. Since 1993, the company has been offering oil field services to the continent. In 2012, Sinopec's overseas assets accounted for 36.5 percent of its total assets, and overseas sales represented 31.6 percent of the total. At the end of June 2013, Sinopec had cumulative investment of about $14.1 billion in Africa. In November 2014, the company acquired one-third of Apache Corp's Egyptian oil and gas business for $3.1 billion. Apache is an independent United States-based upstream oil and gas company. It has 21 years of exploration, development and operations experience in Egypt and is one of the largest acreage holders in country's Western Desert. At year-end 2016, the company held 4.8 million acres in 23 concessions. Sinopec has also invested in Gabon, Sudan, Ethiopia and Angola. In 2013, PetroChina bought a 20 percent share of the Area 4 license block in Mozambique from Italian giant Eni for $4.2 million. Between 2003 and 2010, more than half of China's foreign direct investment in Africa was in the oil sector, according to a 2013 report from the United States International Trade Organization. The biggest investors were Sinopec, China National Petroleum Group, China State Construction Engineering Corp and China Metallurgical Group Corp, which formed partnerships with state oil companies in Nigeria, Angola, Sudan, Egypt, Chad and Niger. Although upstream investment is the main focus of the Chinese State-owned companies' investments abroad, they have been expanding to construction of refineries and pipelines. In November 2009, for instance, CNPC signed a memorandum of understanding with Sudan's Ministry of Energy and Mining to expand the 100,000 bpd capacity of the Khartoum refinery. In exchange, CNPC gained greater access to upstream projects in the country, in addition to the seven upstream projects it already operated. Besides Sudan, CNPC has also invested in downstream projects in Chad and Niger, as well as Egypt, Nigeria and Uganda. In addition to the interest shown by the large State-owned Chinese companies, private companies are also eyeing the lucrative but unexploited sector. A recent oil and gas conference organized by Industrial and Commercial Bank of China, in partnership with Stanbic Bank, on Aug 18 in Uganda revealed investment interest by Chinese companies. The conference, which brought together more than 30 Chinese companies, was aimed at exploring cooperation opportunities between Ugandan and Chinese businesses in the country's oil and gas sector. All the companies expressed interest in investing, not only in Uganda but in the entire continent. Guangzhou Dongsong Energy Group is one such company. According to Jane Guo, its CEO, it is bidding for the construction of a refinery in Uganda. She says her company is one of the two pre-qualifiers for the next stage of negotiation and is hopeful of winning the contract. "We have previously developed the Sukulu phosphate project, so we fully understand the policies that govern various sectors in Uganda. We are thus confident of winning more contracts," Guo says. Guo says the African oil and gas sector presents much unexploited potential and the future looks bright for the companies considering investing in it. According to Pricewaterhouse-Coopers, Africa currently boasts significant quantities of untapped oil and gas, estimated at 8 percent of the world's proven reserves. The figure has increased over the past two decades, from 5.8 percent in 1991 and 7.6 percent in 2001, and the trend is expected to continue. From 132 billion barrels of proven oil reserves, Africa produced 9 million barrels of crude oil per day in 2011. Eighty-one percent of this came from Nigeria, Libya, Algeria, Egypt and Angola. The 2017 PricewaterhouseCoopers Africa oil and gas review says Africa has proven natural gas reserves of 502 trillion cubic feet, with 90 percent of the continent's annual natural gas production of 6.5 trillion cf coming from Nigeria, Libya, Algeria and Egypt. Sub-Saharan Africa has 62.6 billion barrels of proven crude oil reserves, with Nigeria being the top liquid fuels producer in the region, followed by Angola. Together, the countries made up 75 percent of total liquid fuels produced in sub-Saharan Africa in 2012. To fully tap its petroleum potential, the continent requires billions of dollars, providing investment opportunities for foreign countries with capital and expertise. According to the World Bank, the continent's energy and transportation needs will require $50 billion in investment annually over the coming years. 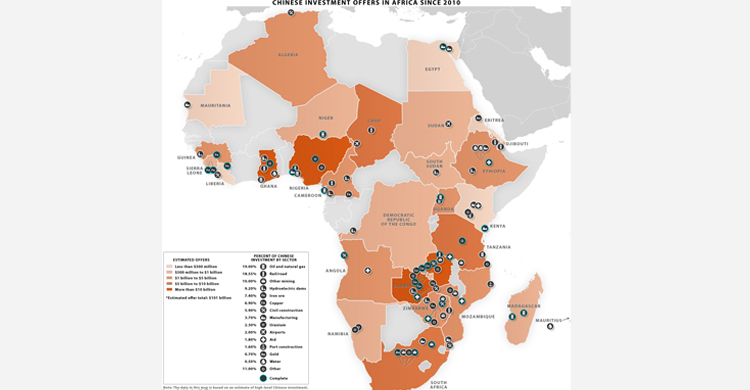 Against that backdrop, African governments are wooing China to increase its investment. Uganda, for instance, is calling on Chinese enterprises to consider investing in its nascent oil and gas sector. According to Ernest Rubondo, executive director of the Petroleum Authority of Uganda, the country's oil and gas sector is expected to attract investment worth $14 billion, with the majority being directed toward infrastructure development. "Chinese investors are welcome to participate in all the investment opportunities that exist in Uganda's oil and gas sector. They can participate as capital providers or contractors," he says. Rubondo says Uganda is working toward delivering its first oil in 2020. Last year, the Nigerian National Petroleum Corp embarked on a roadshow to China seeking investment to bridge the infrastructure funding gaps in the country's oil and gas sector. During the roadshow, the company signed memorandums of understanding with several Chinese companies amounting to $80 billion. The investments span five years and cover pipelines, refineries, gas and power, facility refurbishments and upstream financing. James Karama, head of the oil, gas and industrial sector at Stanbic Bank Uganda, says oil and gas is one of the unexploited sectors in Africa. "Africa is the new frontier, so we expect to see more discoveries of oil which will be sold in the world market. We see African governments working together with Chinese capital and institutions to develop this sector," he says. Karama says many African governments are looking to China for support in exploration of their oil and gas reserves. "Chinese support comes with enormous benefits. Companies set up shop in Africa, employ locals, develop local capacity and engage with the community, so African governments can't ignore them. They are basically better to work with compared with investors from other parts of the world," he says. Additionally, Karama says Chinese have a big appetite for African risks, are more patient and are willing to invest in long-term projects, spanning 10 to 20 years, at reasonable prices. He says China will continue to be part of Africa's social and economic journey due to the growing relationship between the two. However, despite the unexploited potential, the challenges facing oil and gas companies operating in Africa continue to be diverse and numerous - among them fraud, corruption, theft, poor infrastructure and a lack of skills. Additionally, regulatory uncertainty and delays in passing laws are severely inhibiting the sector's development in many countries on the continent. According to Pricewaterhouse-Coopers’ 2017 Africa oil and gas review, some key players have delayed or canceled projects until further clarity can be provided in their respective jurisdictions. They feel they can't move forward until doubts have been removed, given the long-term nature of the required investments. As a result of the number of challenges in the market, Chris Bredenhann, PwC's Africa oil and gas advisory leader, says meticulous planning is required. Xiao Zongwei, president of CNOOC Uganda Ltd, says that because of poor infrastructure and the fact that Uganda is a landlocked country, the logistics cost for the company's projects constitute 30 percent of the investment.